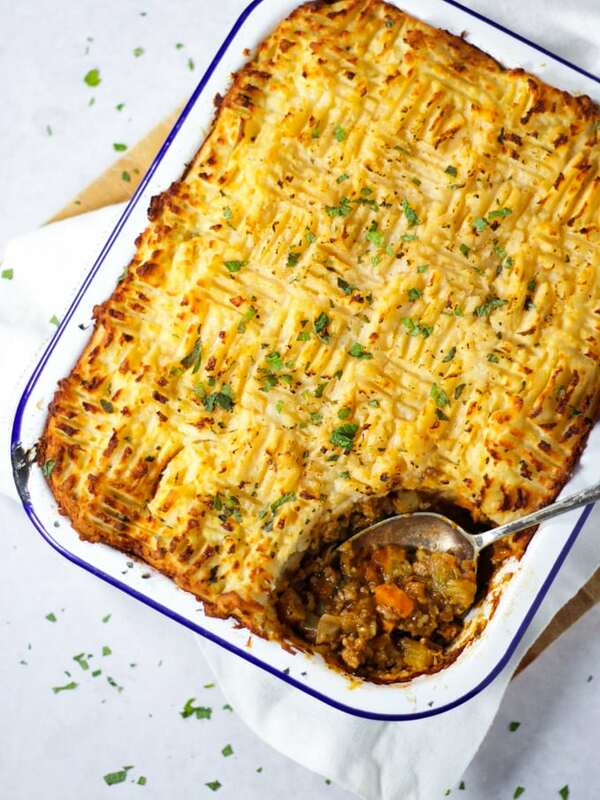 This easy, comforting Shepherd’s Pie recipe is the perfect antidote to a cold winters day. It is also ideal for batch cooking and freezing ahead of time. This lamb dinner can also easily be made gluten free and Slimming World friendly. What’s not to love? I love love love it when a dinner can be prepped in advance, makes a spare for the freezer AND squeezes in a pile of extra vegetables. This Shepherd’s Pie recipe does all that and more. Good, simple, classic family food. I can’t believe I’ve never shared my basic Shepherd’s Pie recipe, so here it is. Real life confession, I never get around to just making a giant batch of this. In reality, I’ll just make it for dinner one night (or maybe at the weekend when I have more time) and make double and freeze one. The recipe below makes enough for six people, or four if you are super hungry. Firstly, finely chop your onions, carrots and celery. 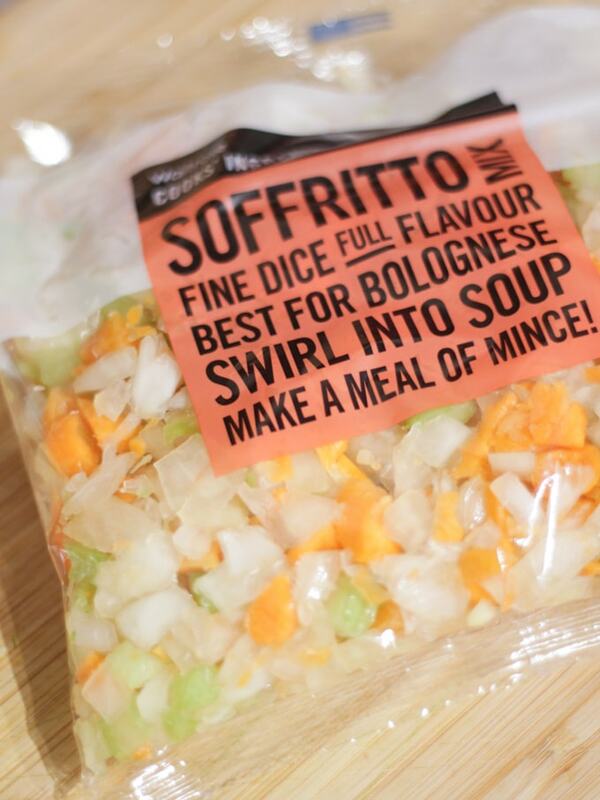 I cheated and used Waitrose Cooks’ Soffritto Mix 400g (honestly these little time saving tips much SUCH a difference). Heat the oil in your pan and fry until the vegetables have softened. I now add a tablespoon of plain flour, and stir well to coat everything. The flour thickens the gravy of your Shepherd’s Pie. Next, add your lamb mince, stirring to break up any lumps and fry until browned. Really do let the mince brown well for Shepherd’s Pie. (See those little crunchy brown bits in the photo below?) It really helps to add flavour I think. Then add beef stock, Worcester sauce tomato puree, sage and thyme. I used dried herbs but you can use fresh if you have it available. Cover your mixture with a lid and simmer for 40 mins. Whilst the meat for your Shepherd’s Pie is bubbling nicely start making your mashed potato. Boil your potatoes for around 15-20 minutes, until they are tender. Add either butter and cream/milk or see my tips section for a recommendation to use eggs instead. I like to use a potato ricer for mashing my potatoes. I find that this simple little piece of kit gives the PERFECT mash every time as there is no escape for any pesky lumps. 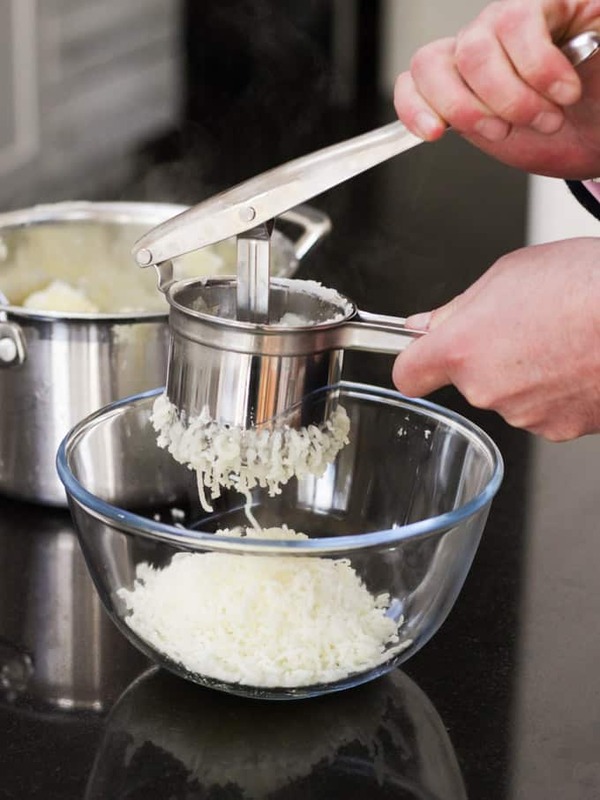 Using a ricer also avoids the risk of that DREADED gluey mashed potato which comes from too much beating or mashing. I’ve had my potato ricer for years and years and use it every single time I make mashed potatoes. This one looks slightly different to mine (more sturdy! ), is currently rated as the top choice on Amazon and costs about £13 – Commercial Grade Potato Ricer. Pour your meat mixture into a large oven proof dish, top with your mashed potato. Ruffle the top of the mash with a fork to help achieve a crunchy topping to your Shepherd’s Pie. You could also add a sprinkling of grated cheddar cheese. 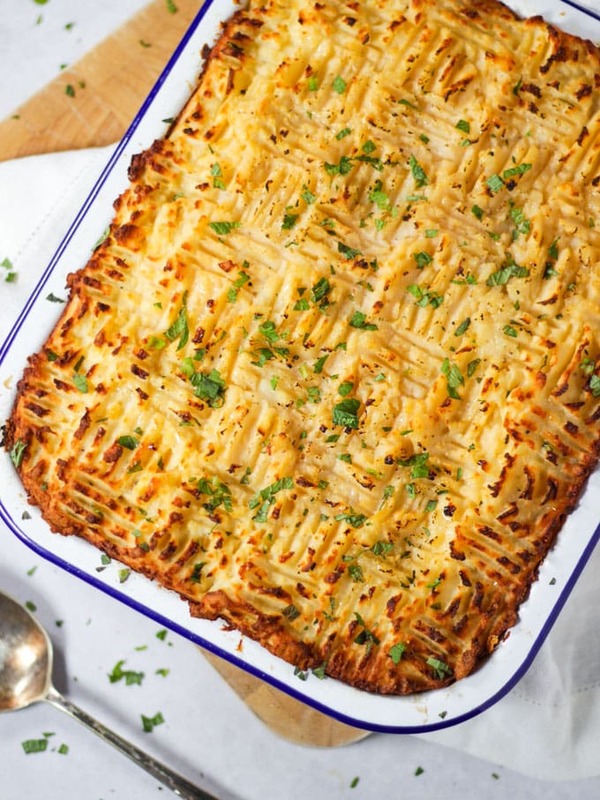 What’s the difference between Shepherd’s Pie and Cottage Pie? It’s all in the meat. Shepherd’s pie contains minced lamb (now the name Shepherd make sense right?). 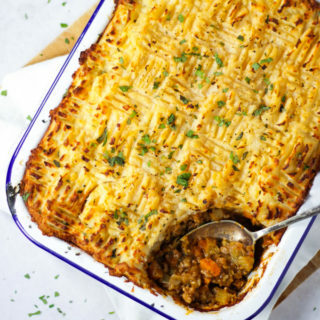 Whereas Cottage Pie contains mince beef… (no clues there as to why its called Cottage Pie, the Cottage part comes from its heritage of being a low cost meal so was a popular dish for farm workers in Victorian times). Whilst we are getting our pie names sorted out Cumberland Pie refers to any type of meat pie topped with mashed potatoes and then a layer of bread crumbs. Whilst not strictly traditional a sprinkling of grated cheese over your mashed potato on both a Shepherd’s and Cottage Pie is delicious. 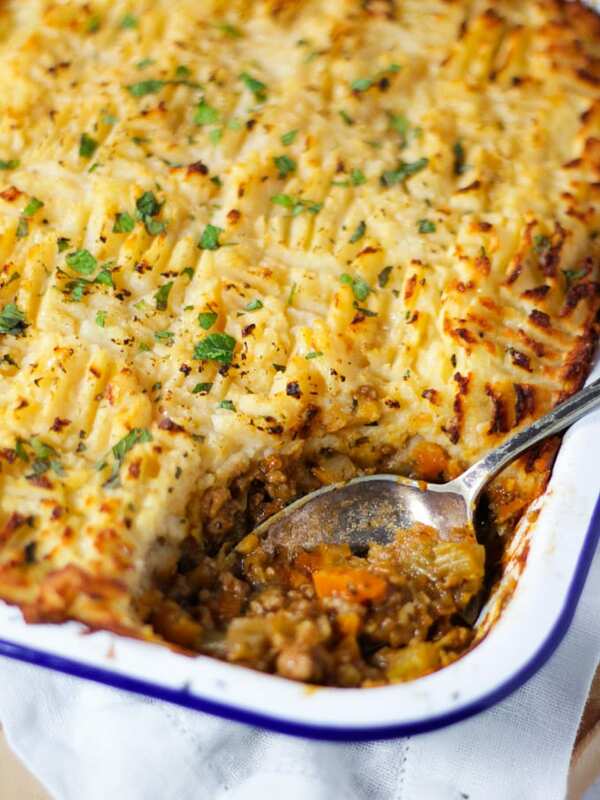 Because Shepherd’s Pie uses lamb mince it can be quite high in fat. If you’d like to reduce this, when you brown the mince, you can drain off an fat in the pan at that point before you add any other ingredients, that will reduce the fat you are actually consuming. You can try to buy lean lamb mince but it’s quite difficult to find. To add some more nutrients, you could also replace the regular white potato mash with sweet potato mash if you fancied. A Shepherd’s Pie is the perfect make ahead food. If not freezing, you could also keep in the fridge 2 days before cooking. What did I use to make Shepherd’s Pie? Using a good store cupboard stock makes a real difference, this is one of my faves. Choosing the right potato for your mash is vital! You need something that has a floury and fluffy texture. King Edward or Maris Piper would be fine, but my top tip would be Desiree. To make delicious mash potato with out adding fat use eggs instead. One to two eggs cracked into your potatoes before mashing helps it to set and give a creamy texture. This is a great way of reducing Syns if you are following the Slimming World plan. 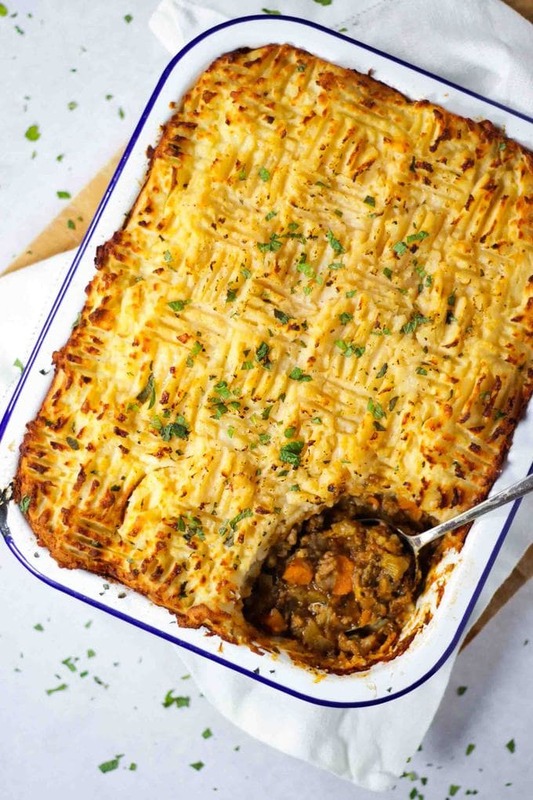 To make this Shepherd’s Pie recipe gluten free substitute the plain flour for cornflour (check your packaging to ensure it is gluten free) or any gluten free flour. Hope you enjoy this recipe as much as we do. 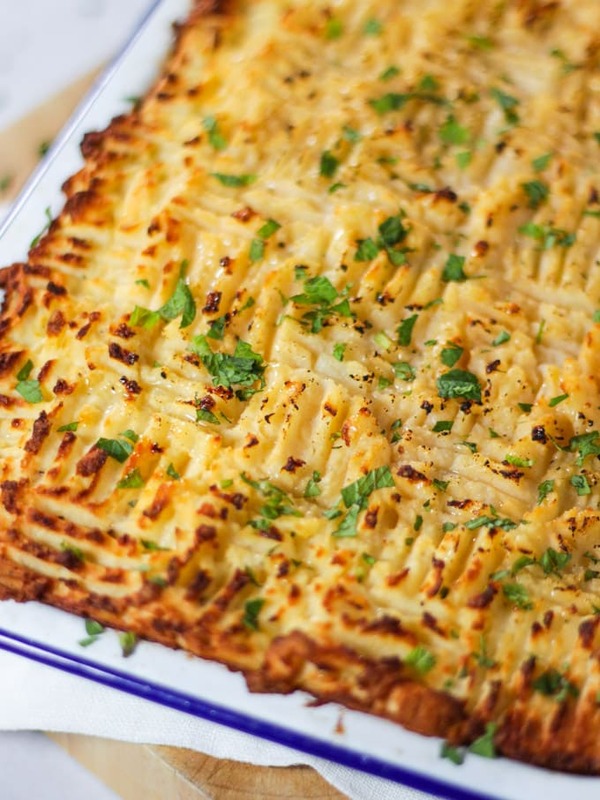 I’d love to know how you got on and what you thought of it if you make this Shepherds Pie recipe. Please rate the recipe and leave me a comment below if you do. Fancy some other make ahead meals? How about my Beef Bourguignon recipe or my Easy Healthy Chicken Curry recipe? Also, if you’d like to show me a photo by tagging me on Instagram (@tamingtwins) I LOVE to see your creations. 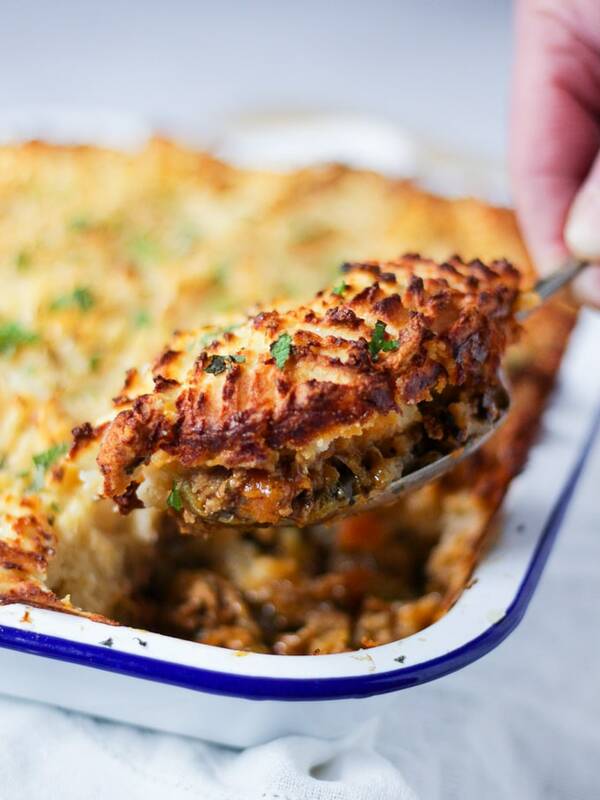 This easy, comforting Shepherd's Pie recipe is the perfect antidote to a cold winters day. It is also ideal for batch cooking and freezing ahead of time. It can also easily be made gluten free and Slimming World friendly. What's not to love? Preheat your oven to 180deg (fan) 160deg (conventional). Heat your olive oil in a large, heavy bottomed pan. Fry your, onions, celery and carrot for around 5-10 minutes until softened. Add flour, stir well to coat everything, cook for a further 2-3 minutes. 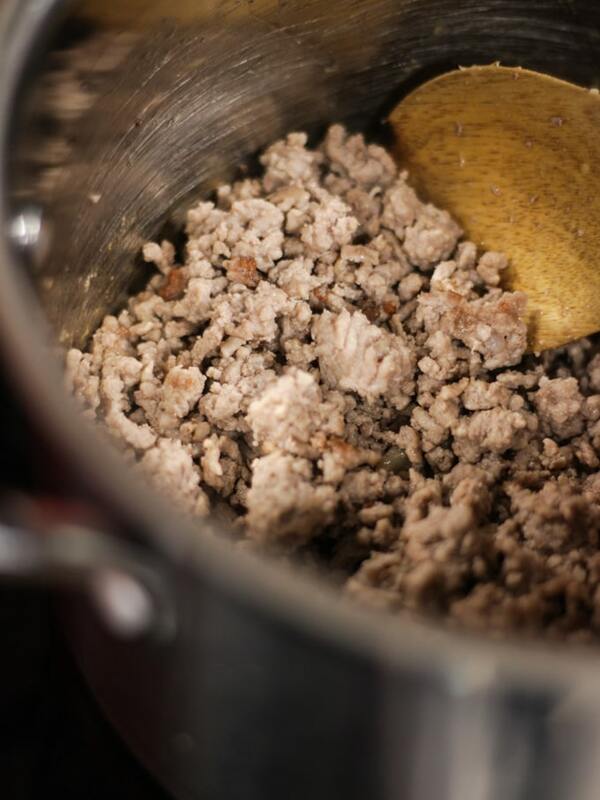 Add in your mince, stirring to break up any large chunks. Fry until browned. Pour in beef stock, tomato puree and Worcester sauce. Season with salt and pepper, this is personal preference but I like to add lots of both in this recipe. Cover and simmer for 40 mins. Whilst your meat is simmering start to make your mashed potatoes. Peel and chop your potatoes, place in cold water, bring to the boil for 15-20 minutes, depending on the type of potato. When the potatoes are ready, drain and mash together with two eggs. Put all of your meat into a large oven proof dish. Spread your mashed potato over the top, ruffle with a fork to give those delicious crunchy bits. You can also sprinkle some grated cheese on top too. Bake in the oven for 25-30 minutes, until the mash is browning and the mince is bubbling at the sides. Check that it is hot inside, it may take a few minutes longer if you cooked it straight from the fridge.